Since few years, French e-Government has put in place a strong effort for e-procedures in order to offer a better service to the citizens and to make the government processing easier. In order to achieve this goal, it is important to provide the designers of the e-services: multiple channel access; easy management of a constantly growing amount of Personal Information; Human-Computer Interface homogenization to bring easy access, utilisability and ergonomics to the e-procedures (they behave « plastic » that means they are able to adapt according the usage context); the compliance to national regulations about privacy and security of personal data to bring a high level of security and confidentiality of big amount of data from various data sources; taking care of frequent ongoing changes in regulations, laws and organization structure. The challenge of this project is to provide a design workshop to the different stakeholders of IT projects for e-Government services (project owner, project management) in order to design and to implement with agility service digitalization. This environment allows the definition of a data space whose the access is secured by a trustful device (smart card, electronic certificate) and that is stored either in a personal physical storage such as an encrypted memory card or an Internet personal vault. It manages a big amount of data with retrieval feature with privacy respect. It provides a way to adapt the human computer interaction to different supports (connected computer, kiosk, PDA, mobile phone…) according to end-user skills (such as disabilities) and to device characteristics (screen size, network access, computing power, keyboard or tactile screen…) and also to the usage context. Finally, the design workshop is user centric for its design method of plastic e-procedures. The conceptual results are the specification of an innovative College Single Window bringing more or less complex (basic, advanced, blue sky) plastic e-services to students and civil servants in the Midi-Pyrénées Region. 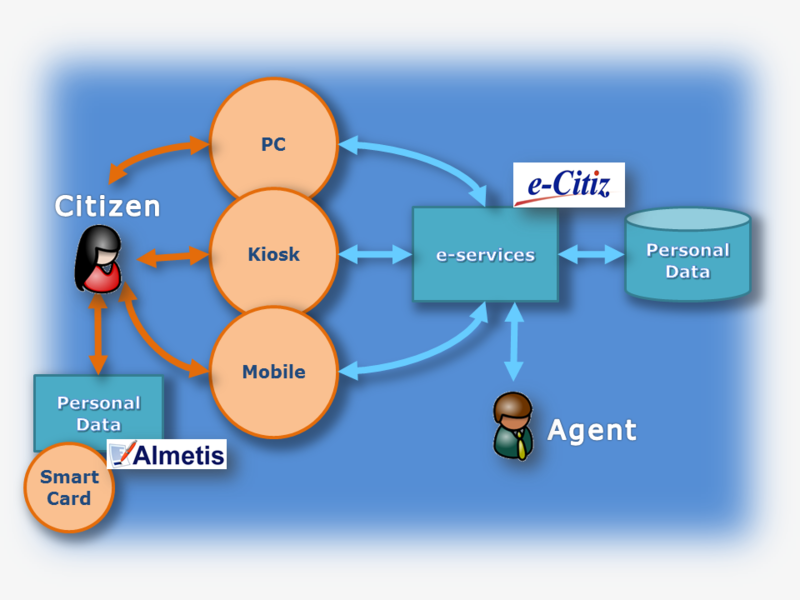 In terms of implementation, the e-Citiz software product gets back major improvements thanks to a better modeling expressivity: a more powerful design tool is now provided for modeling e-procedures. Furthermore, the Almetis products get back many benefits to provide high level security devices. Finally, it gave birth to follow-up collaborative projects such as: Process 2.0 (DGCIS, Web Innovant 2009, Cluster EDIT), PIMI (ANR VERSO 2010, Systematic), UbiLoop (Région Midi-Pyrénées / FEDER 2010), UsiXML (ITEA, 2009), SYSEO (ANR TecSan 2010) and also the proposal of a European action for meta-modeling plastic interactive systems (COST, 2011). The industrial research project was managed by Genigraph e-Citiz. It involves the Almetis SME, academics: INRIA Rocquencourt, Paul Sabatier University (IRIT lab), Joseph Fourier University (LIG lab). The pilots are the Midi-Pyrénées Region and the Ministry of Employment. The project began on February 2007 and lasted 36 months. It was granted by ANR funding (862,423 €) for a global cost 2.1 millions €.